Ever since its introduction, the Macan has had it mostly its own way at the top of the compact luxury SUV segment, now though, some very capable new entrants have made things a bit tougher for the sporty Porsche so for 2017 a new model has entered the fray. The GTS slots in between the full-fat Turbo and entry level trim levels and may be just the thing for those seeking a solid all-rounder. As with the rest of the Macan range the GTS has a very high quality cabin with top level materials throughout. The center console remains a bit busy with buttons lining both sides of the transmission section but everything is laid out logically and a vast range of customization awaits the wealthy shopper. Seats both front and rear are very supportive and comfortable although the second row is a tight fit for taller adults and there is also no change to the cargo space which continues to be limited due to the raked roofline. The GTS receives adaptive air suspension as standard and this allied with a lower ride height gives it an added layer of adjustability and precision when exploring the limits of adhesion. The bespoke larger 20-inch wheels do not deteriorate the ride as much as you would expect thanks to that air suspension, however it is a firm riding car and rough pavements and sharp ridges can still upset the tranquil interior. The steering may not offer the kind of feedback Porsches of old provided but then this is an all-wheel drive crossover and within that context the tiller is as communicative as this segment gets. The detail improvements to the GTS provide it with a poise and cornering ability that beggars belief, few sports sedans can match it let alone other SUVs. Porsche is a past master at clinically dividing up its offerings to cover all niches and the Macan GTS treads an unerringly accurately line between the Macan S and Macan Turbo. Its 3.0-litre V6 Turbocharged motor is borrowed from the S but now produces 360 horsepower (20 more than the S) and 369 lb-ft of torque (30 more). The 7-speed dual clutch PDK transmission remains unchanged and thanks to the added grunt it gets to 60 mph two tenths quicker. Optional Launch Control lops another two tenths off the time getting the GTS to 60 in 4.8-seconds. This is one quick vehicle. Borrowing from other models in the range the GTS offers a mix of options from across the Macan spectrum. Standard specifications include a PCM 7-inch touchscreen, Apple CarPlay and Android Auto compatibility, media player with 11GB hard drive music storage, Cruise control, power liftgate, auto bi-Xenon headlights, eight-way heated and power sport front seats (unique GTS items) with memory function, front and rear parking sensors and automatic wipers to cover just a few more notable items. Macan GTS specific trim includes 20-inch wheels, bigger brakes with calipers painted red, sport exhaust, adaptive headlights, those bespoke front sport seats and importantly an adaptive air suspension system. The GTS also sits lower to the ground than the standard models. Optional equipment is comprehensive and many desirable extras can be had either as individual add-ons or as part of a package. The Premium Package Plus with Porsche entry and drive and lane keep assist amongst its features is worth a look. Dual rear screen entertainment, extended leather trim in a dizzying array of colors and a 16-speaker Burmester audio system are but a small sample of the individual options on offer. Notable safety options include adaptive cruise control, lane change assist and lane keep assist as well as very pricy carbon ceramic brakes which are unique options to GTS and Turbo models. 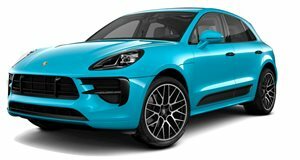 The Porsche Macan GTS expands Porsche’s Sporty Compact Luxury SUV offering to ensure that shoppers are catered for whatever their requirements. With extra power over the base V6 and offering as standard some desirable sporty features picked from the vast options list including adaptive air suspension, sport exhaust and bigger brakes, the GTS is a worthy addition to the Macan range.